Located in St. Louis City real estate, homes for sale in Central West End MO are conveniently located minutes from the Arch, The Fox Theater and the new Cardinals baseball stadium. Central West End Real Estate and Central West End properties are a perfect addition to the St. Louis Real Estate market. Central West End real estate is known for the preserved historical features of the homes and the central and convenient location to just about everything. The Homes for sale in Central West End MO range in price from approximately $125,000 for a studio condo to over $1.2 million. The median home price in 2014 was approximately $450,000. The Central West End is known for celebrating its diversity and eclectic atmosphere. You will find amazing restaurants, specialty stores, and many choices for nightlife. The city has earned the distinction of “Americas Top 10 Great Neighborhoods”. A well-deserved honor based on the great community atmosphere and thriving business environment. The Central West End residents are served by many different schools including Cathedral Basilica School, Central institute for the deaf, Crossroads College Prep School, New City School and Rosati-Kain High School. See Great Schools for up to date ranking on every school in the area. If you are looking for a home for sale in Central West End MO or you would be interested in buying a home in Central West End, please contact St Louis County real estate expert, Sharon Colona and St. Louis Realty for a professional and simple buying or selling process. Call (636) 397-7653 or email at scolona@stlouisrealty.net. Timeless elegance defines this elite CWE location and stunning Neo-Georgian home that has been meticulously restored with period chandeliers, stained glass window additions, and transformed landing and 2nd floor baths. The pool and backyard are oases you will treasure. The fabulous kitchen boasts natural cherry cabinets, Viking appliances, granite, and a wonderful island. Parties here are legendary with the open living and dining rooms, the exquisite and enhanced Baccarat crystal dining chandelier, and the four first floor fireplaces. The gracious staircase leading to the private, yet grand master suite will amaze! You will appreciate 3 zones of AC, forced air and radiant heat, solar panel grid on the roof, newer alarm system, two car oversized garage, many newer windows, and more. The back staircase to the third floor ballroom, kitchen, full bath and two bedrooms could be rentable space. Meant to impress xD; xA;yet exceedingly warm and welcoming, this piece of heaven awaits you! You'll find the elegance of a historic home combined with modern livability in this handsome 1905 town home. Fine architectural detailing, blended with superb updates. The delightful floor plan has formal rooms in front and casual rooms behind. A sunbathed kitchen and family room overlook a spacious rear yard, with deck, wood fencing, parking pad, and lovely landscaping. This private street is the friendliest block in the CWE, with popular New City School, 50+ kids, book club, and social events. The home's classic living room enjoys custom bookcases flanking a fireplace and a splendid staircase. The inviting kitchen features a granite island, s/s appliances, adjoining breakfast room, and walk-in pantry. The master suite includes 2 period bay windows, designer 14 x 9 walk-in closet, and a stellar bath with travertine marble, double vanity, steam shower, stacked washer/dryer, heated floor & towel rack. Also: office with fireplace, guest room with adjoining bath, studio, and much more. This exceptionally-charming 1903 home, designed by George W. Hellmuth, is sheltered from the street by wrought-iron fencing and mature evergreens. The handsome city house has been restored and revised to meet the needs of today's buyer. The delightful kitchen and adjoining family room overlook a richly-landscaped rear yard, with exceptional trees and a gorgeous brick garden wall. The fabulous master bedroom suite includes a sublime sitting room/office with 3 sides of windows, a remarkable master bath with adjoining walk-in closet/dressing room, and an ideal 2nd-floor laundry. The cozy, wood-panelled lower-level rec room includes both a fireplace and a wet bar. The 3,800+ SF home is warm and inviting, with sun-filled rooms, lovely oak floors, excellent floor plan, superb closet and storage space, and an exceptional, walkable location. Fine architectural details include stunning glass-panelled pocket and French doors, and original hardware. An easy stroll to the Chase and Euclid Avenue. 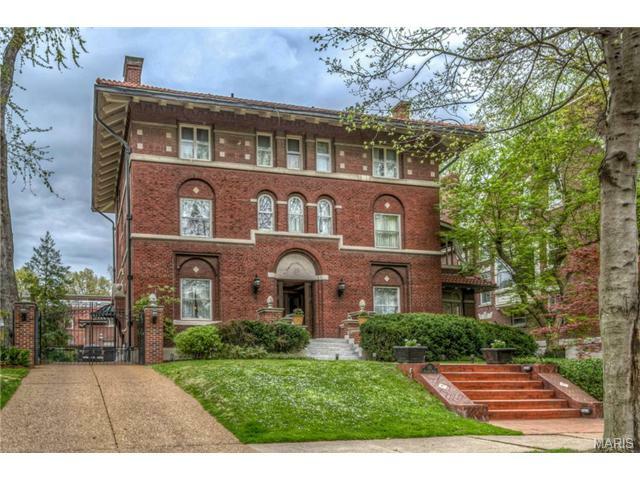 Truly a turn key historic home footsteps in the heart of CWE. Elegant entry foyer featuring period moldings & woodwork, formal living room w/ beautiful marble frplc., 10' ceilings, recessed lighting & original pocket doors from the entry and to formal dining room. Spacious formal dining room with another fireplace, recessed lighting & swing door to butler's pantry. Fabulous, spacious & light filled kitchen with custom granite island that seats 3, granite counter tops, stainless steel appliances, brick tile back splash PLUS add'l breakfast bar that could seat 3 opens to light-filled, 1st floor family room w/ french doors that open to private patio ideal for outdoor dining, grilling or just enjoying your morning coffee. The 2nd floor boast 2, that's right, 2 master suites w/ luxurious baths, walk-in closets, spa-like finishes. Each bdrm on 2nd floor has an on-suite bath. 3rd floor boast a HUGE rec room w/ 2 add'l baths, ideal for a live-in or older children. 2 car garage. Instant Equity: Priced $80,000 under independent appraisal Completely renovated, top to bottom with the modern touches you want, & the charm and history you love. Over 4000 square feet of sensational finished living space, 4 bedrooms, including your master suite, second floor laundry, third floor guest or children's suite, and finished basement living space and tiled storage/utility room - and that's just the start! Greeted by a traditional foyer, the rest of your first floor is open concept which gives you a variety of ways to set your living and entertaining space. Great flow from your kitchen to dining to living room. Extra large bedrooms, luxurious baths, and a finished basement with even more possibilities. New deck, landscaped yard and two car garage, & Euro combo washer/dryer complete this historic home. Best of all - in the heart of the CWE, steps from the shops, restaurants, and bars. Walking distance to the hospital complex and Forest Park. Pack your bags! Walk into a fully updated historic home in prime CWE location. Beauty, elegance, location, price and updates galore! This dream home is move in ready. Main level has original 20th century millwork, exposed brick, 9 foot ceilings, & new hardwood flooring. The custom, luxurious kitchen has subway backsplash, new custom soft close cabinets, brand new stainless steel appliances, & granite countertops. The 2nd floor has three spacious bedrooms with two full bathrooms and convenient 2nd floor laundry.A large master bedroom with a walk in closet, gorgeous tiled bathroom with his & her sinks, & a separate tub & shower sits on the 3rd floor. There is a large newly constructed spacious 2 car garage, space for a den/office, dual heating/cooling system, new hot water tank, & updated plumbing and electrical.The home is located just a few doors down from the euclid shopping district, walking distance to Forest Park & Wash U medical school.